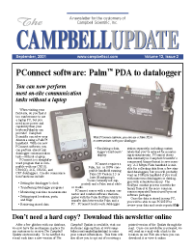 This fall Campbell Scientific will release the RF400, an exciting addition to our array of wireless telemetry options. The RF400 is a 100 mW, 900 MHz, spread spectrum radio/modem that doesn’t need individual licensing. The radio offers exceptional sensitivity (-110 dBm). Two RF400s will typically communicate up to one to 10 miles with inexpensive omni-directional antennas, or several times that using higher gain directional antennas—although performance will vary with line-of-sight and RF noise conditions. A variety of high quality antennas and antenna cables for the RF400 will be available through Campbell Scientific. An SC12 cable connects the RF400 to the datalogger 9-pin CS I/O port and provides communications and power to the radio/modem in the field. For office use as a base station, the radio also has an RS-232 connector that connects directly to a computer serial communication port. An optional wall adapter is available to supply power to the RF400 when the radio is used as a base station or when it is used with older dataloggers. For most applications the datalogger’s sealed rechargeable power supply, charged by a solar panel, powers the RF400. Current drain while transmitting is less than 75 mA. When the power saving settings are used, the average stand-by current can be less than 1 mA. The RF400 has a standard operating temperature range. The RF400 is a 25-channel frequencyhopping spread spectrum radio. Frequency hopping reduces susceptibility to interference from RF sources such as pagers and cellular phones. By selecting different frequency-hopping patterns, interference from other FCC Part 15 devices, such as wireless telephones, is minimized. The RF400’s setup menu can be accessed using most terminal software programs, including Windows HyperTerminal. The setup options allow you to choose different addresses for multiple dataloggers in a point-to-multipoint network. Green and red status LEDs give you assurance that the radios are configured and operating properly. Settings are stored in non-volatile memory, and are retained if power is lost. Two radios can be used as a wireless, half-duplex, 9600 bps connection between a computer running PC208W and a Campbell Scientific datalogger. Contact an applications engineer for more details or to discuss the suitability of the RF400 for your application.